The room erupted with applause as they announced that all of the funding for the Alumnae Initiatives Endowment will go toward enriching opportunities and programming for women across the global William & Mary community. Ultimately, they said, the endowment will provide a platform for alumnae to thrive and reach their full potential. The weekend was the centerpiece of a yearlong commemoration of 100 years of coeducation at William & Mary. Attendees participated in a diverse array of offerings centered around wellness, including intellectual programming and social events. By the end of the weekend, 11 more women had committed to join the Society of 1918 — a society created by women, for women. A total of 363 women have joined the society, including President Rowe, who shared the reasons behind her own membership during the weekend. "Even before I was sworn in as the first woman president of William & Mary, I believed so deeply in this cause that I decided to become a member of the Society of 1918. Today, both my mother and daughter are also members," said Rowe. "I am both honored and delighted to be among a group of compassionate women who are paving a distinctive path forward and shaping a vibrant future for William & Mary and for our alumnae." From the Class of 1948 to the Class of 2020, alumnae of all ages and backgrounds participated in the weekend — which is indicative of how interest in the programming and Society of 1918 efforts spans across many generations. Fran Engoron ’70 and Janet Rollins Atwater ’84, chair and vice chair of the Society of 1918, presented the check on behalf of the society’s members. They also announced the Society of 1918’s new goals: raising $4 million for the endowment and increasing the number of members to 1,918. "From the time I was an undergraduate, I knew that William & Mary women were incredible. Seeing the society and our gift come to fruition proves this to be true, and I have no doubt that our society will continue to grow exponentially. Our members have so much creativity, enthusiasm and love of William & Mary, and that spirit will help us meet this new goal," said Engoron. The Society of 1918 is named for the year William & Mary first admitted women students. It offers opportunities for members to deepen their connection with one another and the university while inspiring, encouraging and empowering all W&M women. In its first year, the society quickly surpassed their initial goal of $1 million and 100 members. "We were so excited to meet the $1 million goal, but when the check came on the stage for $2.6 million, we were blown away," said Kirsten Shiroma ’05, a charter member of the society. "To present the check to President Rowe and hear her thanks is so rewarding." The society is the outcome of the Women & Philanthropy Task Force created in 2012 at the behest of the William & Mary Foundation. They studied existing research and best practices, conducted surveys and created strategies to fully engage women as leaders, donors and advocates of William & Mary. The Alumnae Initiatives Endowment was established by the society as part of their mission to grow women’s engagement, leadership and philanthropy and celebrate and honor William & Mary women. "It's really exciting to be part of this society, even though I am not an alumna — my daughter is," said Connie McCarthy P ’02, a charter member of the society. "This is a community of people of all different backgrounds who love William & Mary. I am so encouraged that the society continues to grow." 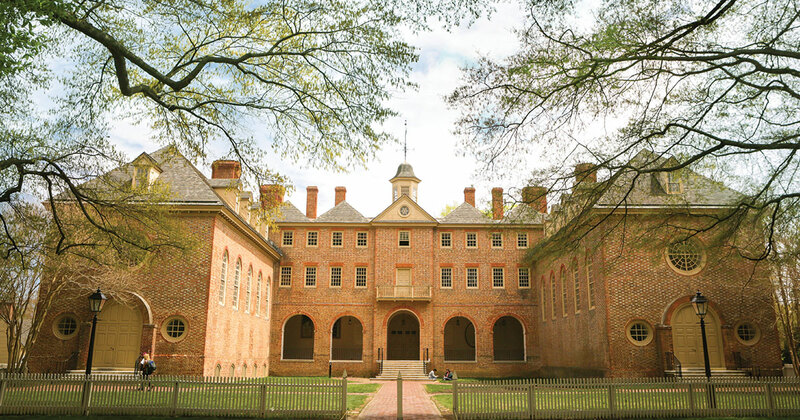 William & Mary is now a national leader for women and philanthropy and the support of society members, in many ways, has propeled the university forward in this realm, said Rowe. Collectively, the women in the Society of 1918 have given over $338 million to the university in their lifetime. 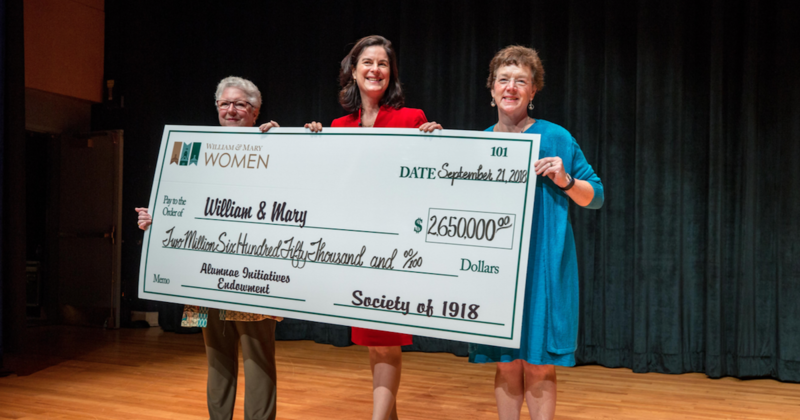 Smaller gifts from William & Mary women since the beginning of the For the Boldcampaign are also adding up — gifts of $250 or less contributed by more than 37,111 women total $8.7 million. Women have also contributed more than half of the $800 million raised in the campaign to date. For more information or to join the Society of 1918, visit wmalumni.com/societyof1918. To learn more about other events associated with the 100th year of coeducation visit www.wm.edu/sites/100yearsofwomen.